I haven't had time to get to the lumberyard to buy all the mahogany I'll need for the toerail project, but I've been anxious to get going and the dinghy project isn't too time consuming. 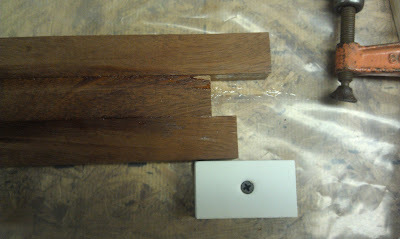 I had some scrap mahogany lying around and decided that I should test out my laminated toerail theory to make sure I actually can bend it on the toerail jig I put together. First things first though, it was time for a new toy. I have wanted to get a thickness planer for years but could never really justify it because I was able to do most of my edge jointing with a jack plane and had good results. The difference is that this time I would effectively need to joint 140 feet and it would take way too much time. Arguably, I should have purchased a dedicated jointer for this job, but I also see the need for a thickness planer and I know a few people who do edge jointing with a thickness planer. So it came down to: "If you had to choose, what would you get?". I did some research and found that while I would love to get the DeWalt DW735 planer, it just isn't in the budget. I ended up choosing the low end Porter Cable TP305 (rebranded Delta 305). It was on sale at Lowes for $249 and I had a 10% off coupon so I ended up getting it for $225. I spent some time tuning it to reduce snipe and got it to a reasonable level (I figured snipe loss into the cost of the mahogany I need to purchase). Once I had the planer running the way I wanted, I cut 3-1-1/8 inch pieces of mahogany about 2.5 feet long (the length of the scrap I had). 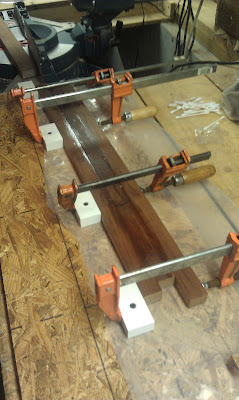 I ran all the pieces through the planer to make nice jointing edges and test fitted them on the toerail jig. The final planed with for each piece was about 1-1/16. 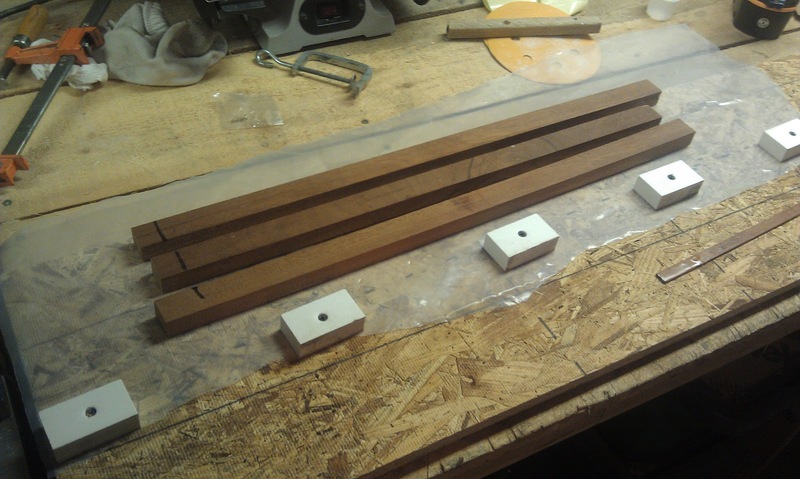 Once I was confident that I could bend the pieces onto the jig I mixed up a small batch of epoxy, painted all the edges and bent them onto the jig. I left the layup overnight and came back in the morning to find it 'dry'. This was a mistake. It seemed dry, but I failed to recognize the force involved in bending the wood on the curve. When I first pulled the layup off the jig it appeared that there was minimal springback (~1/16 inch) and it appeared to hold the curve, but when I brought it upstairs to show my wife about an hour later it was clear that it was losing its curve. I hope that this was due to the epoxy still being green (the overnight cure was in 50-55 degree temps so I don't believe the 12 hours I had it on the jig was long enough. I am going to seek some advice on the forums to see if this is in fact the case, or if the wood will naturally spring back regardless epoxy over time. This will mean that I'll have to get the rail on the boat immediately after pulling it off the jig. If this is the case, I'll need to wait until the temps. are warmer outside so I can get the bulwark prepped and ready to go. Springback looks good... for a little while at least. Overall, I think this was a success though. I may have to adjust some schedules to account for springback, but I think I have proven that the lamination will work as designed. 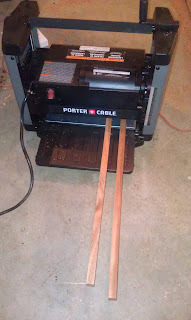 I am going to run the piece through the planer once I am sure it is really dry (I don't want to gum the knives up) to see how the quasi finished rail will look like. Inspecting the joints looks like they are really tight and will look good. Edit: Below is a post planer picture. 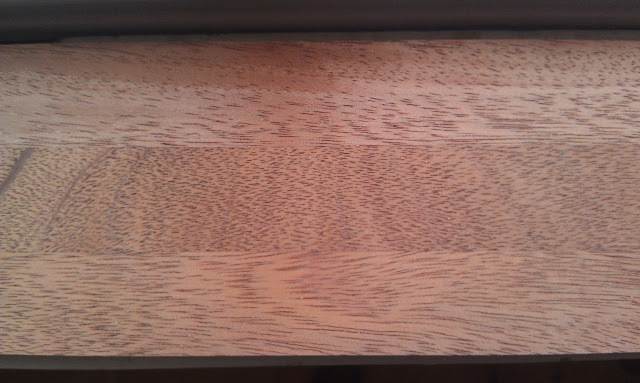 It looks good to me, even if the grain isn't correct. Once I get the real wood, I will take care to keep the grain together. Even though I have launched my diabolical toerail plan, I won't be able to get to the lumberyard to purchase the mahogany for another few weeks and move forward on the project. So in the meantime I've decided to infect my son with the boat fixing sickness just like my dad did to me. We've decided to tackle restoring the dinghy as an interim project; the sailing bug has already hit him, but my job as father won't be complete until I infuse him with a love of boatyards, power tools, and highly toxic solvents. Click 'The Dinghy' link above for more details.